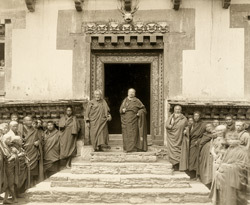 Photograph of the Abbot of the Dratshang or central body of lamas taken at Trashi Chhoe Dzong at Thimphu in Bhutan, by John Claude White in 1905. The Abbot is standing at the entrance to the monastery, with monks grouped on either side. Another copy of this photograph is captioned 'Taloo Gompa Gateway. Lama Brother of the late Dharma Raja'. This is one of a set of photographs documenting White's mission to Bhutan to invest Ugyen Wangchuk, the Penlop (Governor) of Tongsa (Trongsa) in central Bhutan, who had assisted the British in their relations with Tibet, with the order of Knight Commander of the Indian Empire. The British conferred the titles used in India to Bhutanese leaders; thus, the spiritual head was called the Dharmaraja and the secular head was the Devaraja. The Bhutanese title for the Chief Abbot is Je Khenpo. The fortress of Trashi Chhoe Dzong overlooking the Thimpu Chhu river is the summer residence of the Chief Abbot or Je Khenpo together with the central monk body of Bhutan. The Dzong was developed on the site of a much older monastery in the 17th century by the Shabdrung Nwagang Namgyal, the powerful lama who unified Bhutan and helped define its identity. He devised a dual system of administration whereby dzongs or fortified monasteries housed the civic as well as monastic bodies in separate wings and symbolised spiritual and temporal power.